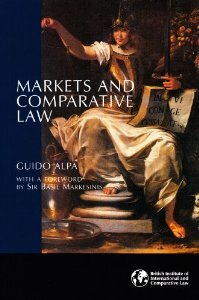 Available for the first time in English, in this latest collection of essays Guido Alpa brings his cosmopolitan approach to current issues in European, private, and commercial law. Covering a broad range of topics, Alpa provides thought-provoking discussion and insight on the themes of legal harmonization and the influence of comparative law on the evolution of legal forms. Accessible and informative, he writes with unique authority on current developments and issues regarding fundamental rights, the World Bank, contract law, family law and changing social norms, and the effect of modern human rights instruments on private law to name just a few-illuminating different solutions to common legal problems. His observations are an essential addition to the existing literature on European private law, and readers will benefit not only from his own deep interest and research in law but the breadth of his expertise in history, classics, literature and politics. Most lawyers will find in this book something of interest as well as plenty of cause for envy for the culture of a man who is not only an exemplar of Italian learning but also a good and loyal friend of our own law. One can thus not only commend this book to one's colleagues...but also congratulate the British Institute of International and Comparative Law on its initiative to make these essays available to English speakers.